The 42 million people uprooted by war who we talk about during the exhibit do not include those displaced by natural disasters, such as earthquakes and hurricanes. But many of the people affected by such disasters often end up living in IDP camps, in some of the same conditions as those displaced by violent conflict—vulnerable to disease and lack of food and water, and having suffered physical and mental trauma. On August 15, 2007, an earthquake measuring 7.9 on the Richter scale shook the coast of Peru, killing 600 people, wounding 2,000, and making tens of thousands of people newly displaced. 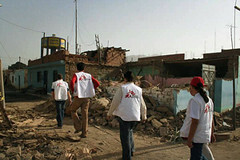 MSF arrived within 24 hours to assess the needs, and Luis Encinas served as Emergency Coordinator for the mission that followed, leading his team into the severely affected town of Guadalupe. Read part of the diary Luis kept during the emergency intervention below. You can also read a story about the emergency intervention here. There's something about Guadalupe, something that is not understandable even with the best will in the world. In the town center there is a sense of desolation everywhere. Practically all the houses have been destroyed. People live on the ground, outside, or under roofs made of cardboard and old rags. It has been nearly two weeks since the earthquake hit, and it seems like it happened yesterday. There have been some ad-hoc distributions of food and water. The health center, by a miracle of nature, has survived. But inside, the staff are like zombies. Over a week, while they struggled to get back on their feet, the number of consultations tripled. The doctor has no mental strength left: "I am empty," he tells me, with tears in his eyes. The center has become a sort of spiritual refuge—the mayor is there, but he is also having trouble concentrating. The inhabitants feel that they have been abandoned. We later discover, behind a partly destroyed house, a mother and her little girl who had been trapped for hours under the debris of their house, but had survived. The two of them are lying on a makeshift bed; the mother has swollen feet, one of which is bent. Wendy, her five-year-old daughter, has a cast which covers her legs and hips, a cast that smells of urine and the odors of a wound. Their story is a moving one. The day after the earthquake her husband had brought them to the hospital in Ica, a scene of total chaos. It took them one and a half hours to travel the 12 km to the hospital. They stayed there for two hours and then were sent home because their lives were not in danger. As for us, in the following days we saw nine other people in the same situation: fractures of the pelvis, humerus, lumbar vertebrae. For three long days, our priority goes by one name: Guadalupe. The media will have a field day here, reporting about the "olvidados," "the forgotten ones."